The color yellow in Oriental rugs has an extensive history, with its vibrant as well as harmonizing qualities. 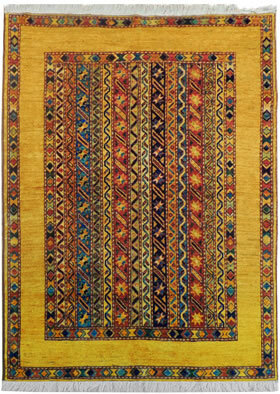 The oldest piled carpet known, the Scythian Pazyryk from the 5th century BC, includes in its decoration yellow ornamental elements in the horses, griffins and border backgrounds. Yellow symbolizes the sun and air, provider of light and life, while it also has been considered an imperial color symbolizing power and glory, at times prized by royalty and the noble class as exemplified in many palace rugs. Throughout the rug producing areas along the ancient Silk Road, different cultural groups each had their own indigenous dyeing materials and traditions, the dye recipes often being family, tribal or trade secrets. Yellow, unlike red and blue, can be produced from numerous plants. Of over twenty sources, the most commonly used plant for yellow dye is weld, a delicate vine of the reseda family, which grows wild in many parts of the Middle East. Its flowers, stems and leaves are all used for the dye. The amount added to the dye bath varies up to one hundred percent of the weight of the wool, depending on what shade of yellow is desired. An extensive variety of hues and intensities of color can be obtained from many of the other dye sources and their combinations. A common alternative source is Sumac, but it does not produce a yellow as vivid as from weld. Isperek, a yellow-flowering larkspur produces a beautiful, muted gold. Pomegranate rind, which is cheap and plentiful, gives an acceptable yellow or yellow-brown. Wild saffron provides a reddish-yellow, while cultivated saffron results in a pure yellow. Even pear leaves, almonds, and buckhorn berries can be used to create unique yellow shades. While yellow is often combined with blue to create a range of greens and with red for rich oranges and browns, it is valued for its radiance and cheerfulness on its own. Come and see examples of beautiful vegetable dyed rugs at our gallery, or view our collection online at www.themagiccarpet.biz.